The AVTE-3000 offers the highest throughput in testing and programming Flash memory devices of any system on the market. 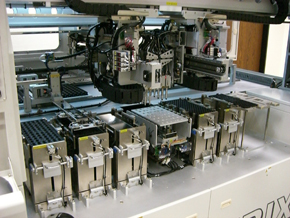 The system can process up to tens of thousands of devices per hour. For example: the AVTE-3000 can program and verify 16,000 typical uSD cards with 10MB/s read & write speeds per hour. 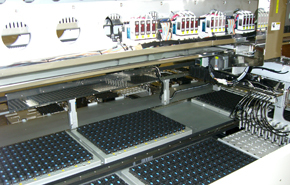 The system can be configured for a variety of devices by swapping out the load boards. This changeover process can be performed within 10 minutes. Indexing time is also extremely low. 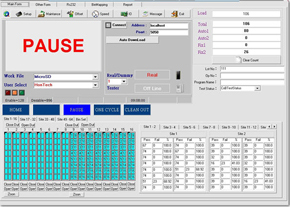 The time it takes to replace a test or pro- gramming tray and feed it to the test and programming load board takes less than 10 seconds. The AVTE-3000 is capable of testing all current and future memory card and storage devices including UHS-SD cards (104-208MHz). The AVTE-3000 contains 8 test channels, each of them containing a load plate populated with test sockets.